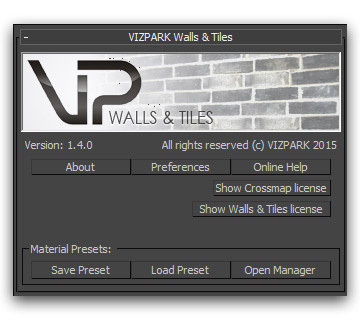 With the plugin updates 1.4 of Crossmap and Walls & Tiles we have introduced a new licensing system that allows for node-locked and floating licenses. Each license now requires ONLINE ACTIVATION and includes 2 activations with one serial number, so you can use each activated plugin (with one serial) on up to two machines, your workstation and laptop or two workstations. Rendernodes still don´t require activation and will not be limited in the number of nodes, so you can use as many render nodes as you want. Floating licenses can be extended with additional licenses, that can be purchased separately. WHY A NEW COPY PROTECTION ? Well, guess what, mainly because of illegal use! Our previous copy protection included a simple serial number but no online activation. 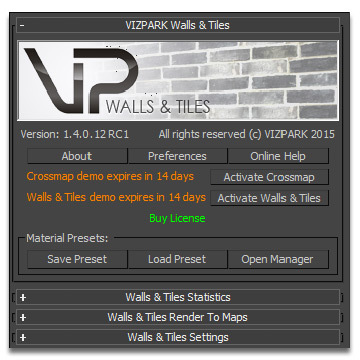 Anyone was able to copy Walls & Tiles and use it with a cracked version of Crossmap. While we believe it should be easy for our loyal customers, we saw that the release of the cracks have increased the website traffic by 10 times, but decreased the sales significantly. In order to continue the development and improve our software products, we saw no alternative to include a better protection. At the end, you our loyal customers, will benefit from this step, we hope. The NEW serial number format has 6 x 5 digits with capital and small letters and numbers, e.g. NOTE: If you bought plugins before the updated license system was integrated, you can find the new serial numbers in your MY ACCOUNT in the tab MY LICENSES. The OLD serial number format had 12 digits with all capital letters and numbers, e.g. NOTE: Generally, when you buy a PLUGIN product, you will receive a confirmation email that includes the SERIAL NUMBER(s) for each product. 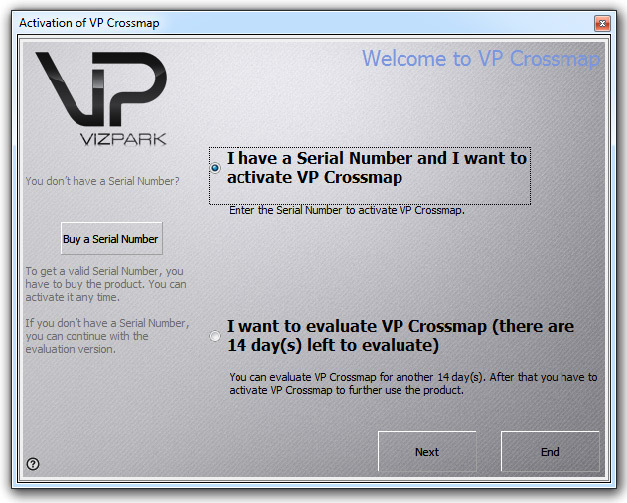 In addition you will find the serial numbers in your VP ACCOUNT on the website under MY ACCOUNT – MY LICENSES. Each plugin comes with an installer that makes installation as simple as possible. During installation you will be asked to choose the license type, either NODE-LOCKED or FLOATING-LICENSE. It´s important to choose wisely, as the license type CANNOT be changed later! NODE-LOCKED licenses are tied to the computer where the license was installed. So once installed on this computer, it cannot be removed and the license will be used on this computer only. FLOATING LICENSES can be used in a network by different computers up to the number of licenses that are available. If you decide to use a floating licenses, please make sure that the installed license file can be accessed by all computers in a network with read and write access. Do NOT install the license file locally where other computers in your network cannot access the file. NOTE: Please be aware that floating licenses will require more user maintenance and network knowledge on your side in terms of accessibility and their concurrent usage in a network environment. Once the plugins are installed, you will either see an activation screen that pops up when you look for the material or map in the new materials / maps list or you can call the activation screen from the plugin header. 2. Activate WALLS & TILES. So you need 2 different serial numbers, which are both provided during purchase. Only when both plugins are activated, you´ll have a permanent license, otherwise, you´ll have the demo period of 14 days after installation. 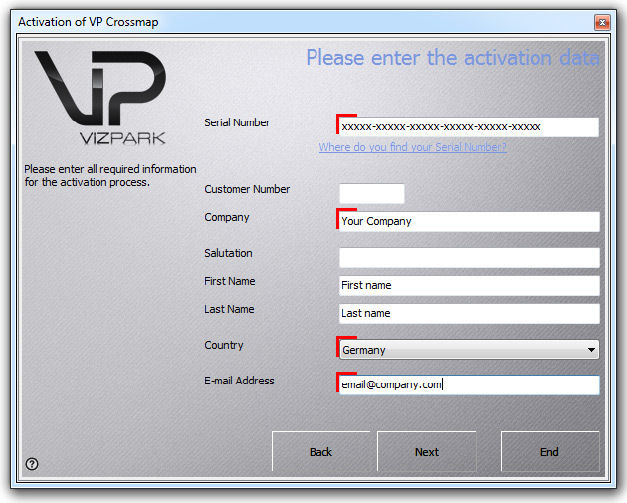 If you choose ACTIVATION, you will be asked to enter your SERIAL NUMBER (which can be found either in your order confirmation email or in your VP ACCOUNT under MY LICENSES), your name, company country and email address. These don´t have to be the same credentials that you have used in the VP online shop, we recommend to use the same though in order to help find your information faster if support is required. If your computer is connected to the internet and your serial is valid and does not exceed the activation limit (2 activations are allowed), your license will now be activated. A successful activation will bring up this screen. If you have bought additional floating licenses, you can enter the activation keys here now ( You can also add additional floating licenses later ). Click NEXT to finish the activation process. GREAT! You now have a permanent license! If you started the activation from the PLUGIN user interface directly (and not while opening the new materials / maps list) then you need to re-load or re-initiate the plugin. Just create a new map or material and the demo note should disappear. With the SHOW LICENSE button(s) you can now open the LICENSE VIEWER. With the successfully activated plugin, the demo note has disappeared and you have a permanent license. The buttons have changed, so that they open the LICENSE VIEWER. The LICENSE VIEWER provides information about the demo period, activated licenses, floating licenses and more. You can also add further floating licenses here. Just use the Activation Key button and add further ACTIVATION KEYS here. NOTE: Activation keys are different from Serial numbers and you cannot just enter additional serial numbers here if you want to increase the number of floating licenses. ONLY ACTIVATION KEYS for further Floating licenses will work here. If you have any problems activating the plugins, please send us a Support request, stating your order number, system setup and detailed description of the problem (ideally with screenshots).